Germany's Rheinmetall has celebrated the global unveiling of its Lynx KF41 infantry fighting vehicle, its chosen offering for Australia's LAND 400 Phase 3 project. The new vehicle, unveiled in France at the Eurosatory 2018 defence and security event, was designed to meet multiple challenges the future battlefield is expected to face. "Most experts agree that land forces will face unprecedented threats on the future battlefield, where emergent technologies have substantially changed the balance of power. Key technologies influencing armoured fighting vehicle (AFV) design for the future include anti-access/area denial systems that reduce the ability to gain and retain air dominance, electronic warfare systems that will deny reliable communications, enhanced artillery systems that restrict freedom of action, and advanced AFV designs that are difficult to defeat with existing systems," Rheinmetall said. "In concert with the technology challenges of future combat, land forces need to be relevant across the full spectrum of conflict, including contributing to peacekeeping operations, conducting counter-insurgency campaigns and engaging in general war-fighting against constantly evolving threats in diverse global environments." Rheinmetall said the Lynx KF41 is a complete family of vehicles that utilises a common drive module and a flexible mission kit arrangement to allow any base vehicle to be configured as an IFV, an armoured personnel carrier, a command vehicle, a recovery vehicle or an ambulance. The German military vehicle designer, which was selected to deliver Australia's LAND 400 Phase 2 project, said changing from one configuration to another can occur within eight hours for the KF41. "This system provides significant total life cycle cost savings due to base vehicle commonality, allowing customers to adjust force structures or develop new capabilities in an affordable and timely manner," the company said in a statement. Along with the Lynx KF41 family of vehicles, Rheinmetall has also designed a companion Lance 2.0 turret, which the German designer said will result "in a revolutionary IFV with a level of adaptability, survivability and capacity not seen before in an IFV family". 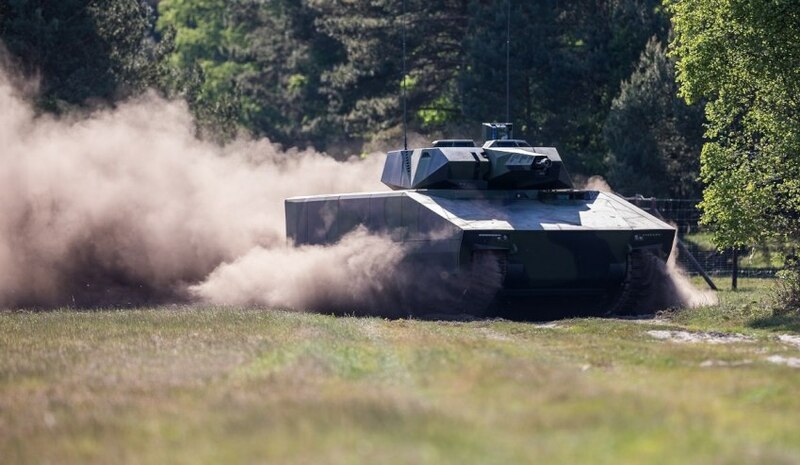 Rheinmetall said the new turret comes with various enhancements to provide a troop of KF41 vehicles with a high level of organic capability to allow troops a disproportionate effect on the battlefield. "The Lance 2.0 features enhanced protection for critical subsystems against kinetic and fragmentation threats, improving system survivability during close combat. The next enhancement is the integration of the new Wotan 35 electrically driven cannon that fires Rheinmetall’s proven and in-service 35x228mm ammunition family," Rheinmetall said. "The Lance 2.0 has two flexible mission pods fitted to the left and right of the turret that allow installation of a variety of sub-systems to give the turret a specialist capability. Examples of customer-selectable mission pods include dual Rafael Spike LR2 ATGMs, non-line of sight strike loitering munitions, UAVs or an electronic warfare package." Ben Hudson, global head of Rheinmetall’s vehicle systems division, said the Lynx KF41 will meet the needs of the world's future forces. "With the Lynx KF41, the Rheinmetall team has developed a truly innovative next-generation combat vehicle," Hudson said. "The breadth of capabilities that a Lynx IFV provides soldiers results in a veritable Swiss Army knife that has unprecedented utility across the full spectrum of conflict. Its modular, adaptable survivability systems allow the vehicle to evolve through life, the high level of mobility will provide battlefield commanders great tactical flexibility in combat, and the diverse effects that the Lance 2.0 turret can generate allow the crew to deal effectively with a wide variety of battlefield situations." The Lynx KF41 also features a "digital backbone with a generic open architecture", which Rheinmetall said will allow easy integration of new mission systems. The entire survivability system is being spruiked as "modular and upgradable" to allow the vehicle to cope with the highly adaptive threats faced on the battlefield. "Different survivability kits are available for peacekeeping situations, counter-insurgency operations in urban terrain and mounted combat against a peer. No other vehicle can adapt to diverse environments across the full spectrum of operational challenges like the Lynx KF41 can," Rheinmetall said. The Lynx KF41 also features the latest generation of propulsion technology with an 850 kW (1140hp) Liebherr engine and a Renk transmission. A flexible suspension system has been developed by Australia's Supashock, meaning the Lynx can be configured to carry various mission kits and survivability packages without compromising mobility. "When configured for mounted combat operations with the Lance 2.0 turret and a survivability package suitable for peer-on-peer combat, the Lynx KF41 weighs approximately 44 tonnes. In this configuration it provides class leading mobility due the high power-to-weight ratio of 26 hp/t, while still leaving up to six tonnes of reserve payload for future growth," the company said. The modular survivability systems of the Lynx will also provide unprecedented flexibility for armed forces to cope with the wide variety of threats faced across the spectrum of conflict, Rheinmetall said. "The ballistic and mine protection packages can be easily exchanged, even in the field if needed, while the full spectrum of threats have been taken into account, including roof protection against cluster munitions. The Lynx KF41 with Lance 2.0 has been designed not only for passive and reactive systems, but also for an active protection system to defeat rocket-propelled grenades and anti-tank guided missiles," the company said. Should Rheinmetall be selected for the LAND 400 Phase 3 project, the Lynx vehicles will be built in Ipswich, Queensland.